Rachel, a 35-year-old spinster schoolteacher living with her demanding mother, realizes her life is a pointless dead end; when a former schoolmate visits her small New England town, she has her first sexual experience and makes an effort to come out of her shell. 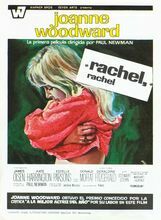 Paul Newman's directorial debut, his wife Joanne Woodward giving a first-rate performance. Received Oscar nominations for Best Picture, Best Actress, Best Supporting Actress, and Best Screenplay.